Harry Griggs was born in Ipswich in 1881. 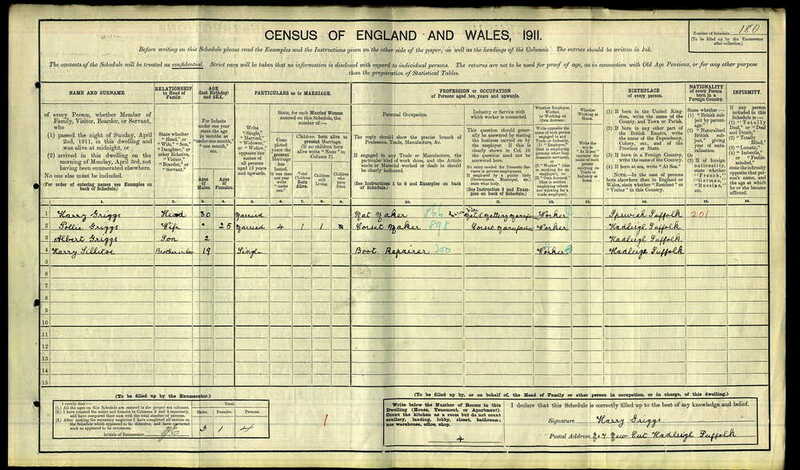 By 1911 he was married to Pollie and living at 7 New Cut, Hadleigh with their 2 year-old son Albert. Also living with them at that time was Harry Sillitoe, Pollie's brother. In 1911 Harry Griggs was a mat maker and Pollie was a corset maker. 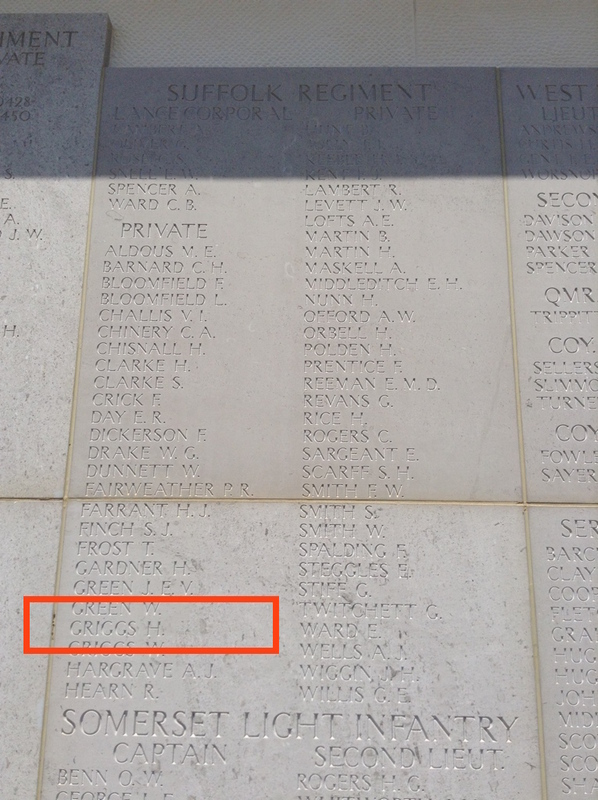 We are not exactly sure when Harry enlisted into the army, but his regimental number of 2313 would suggest he enlisted into the 1/5th Suffolks just after the outbreak of the war. We know that the 1/5th Suffolks were mobilised on the night of the 4th/5th August 1914 and so Harry would have joined them not long after they were mobilised. 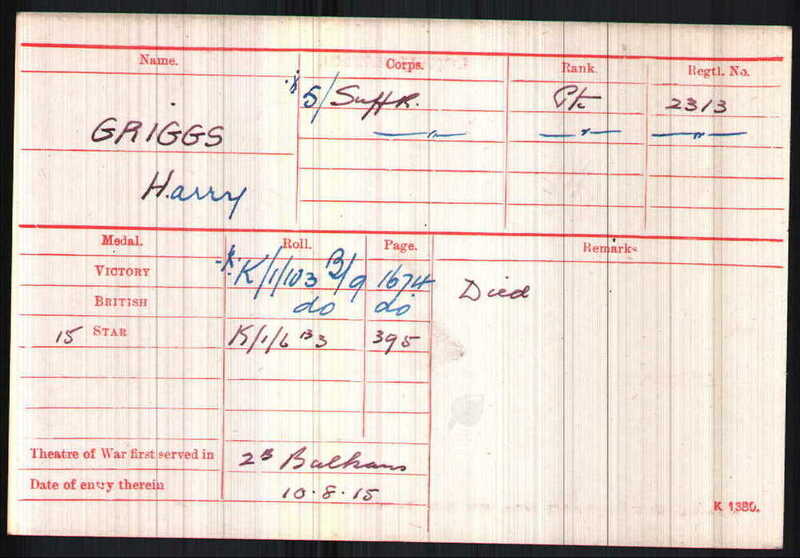 The whereabouts of Private Harry Griggs' Medals are not known, however, the medal index card above states that he was entitled to the above three medals. The 1st/5th Suffolks completed their training and preparation and were re-equipped for service in the eastern theatre. They embarked along with the rest of 163 Brigade and the 54 Eastern Division at the end of July from Liverpool bound for Gallipoli. 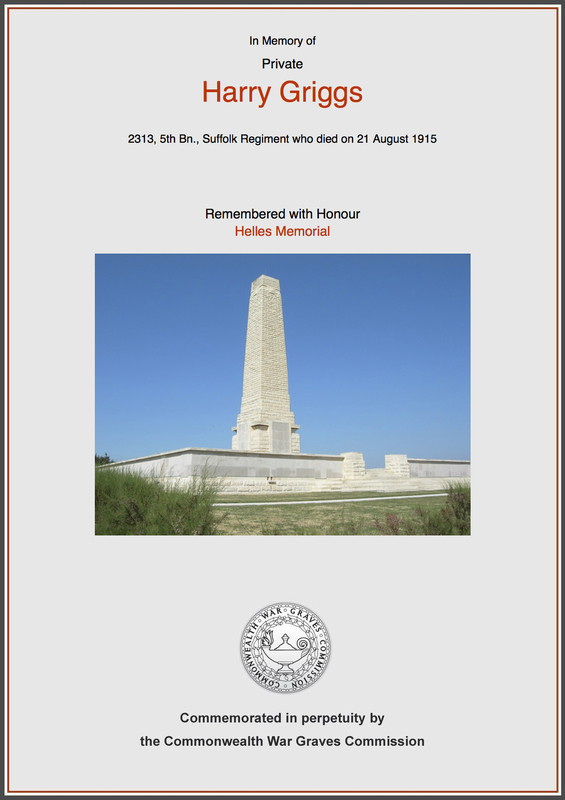 They arrived and went ashore at Suvla Bay on 10th August 1915 and were quickly moved forward and by midday on the 12th were manning the forward trenches on the Anafarta Plain. At 4pm they were ordered forward as part of a 163 Brigade operation to clear the Plain of snipers in preparation for a much larger Divisional operation that was planned for the following day. The battalion was on the left of the brigade line and 'A' Company made up of Hadleigh men were in the first wave. There was at least 75 Hadleigh men involved and this was a true baptism of fire. They were told it would be a straight forward advance to mop up the odd sniper, but in reality they faced a determined and ruthless enemy. The enemies intimate knowledge of the ground was key. They sniped the Suffolks who could not see the firing points and even if they could, they had no artillery support to combat the snipers. In addition, the Turks made best use of their own artillery which ultimately halted the brigades advance. The Suffolks fell back to a shallow river bed / ditch where they formed the new front line. A few days later they were relieved and returned to the reserve trenches where they discovered that the attack had cost them dearly; 11 Officers and 178 Other Ranks were killed, wounded or missing. Although official records suggest that many of the Suffolks went missing on or after the 21st Aug, we now believe that they were actually lost during the advance on the 12th. On that day, at least 16 men from Hadleigh were killed. Due to the nature of the fighting, their bodies were never recovered from the battlefield until the early 1920s. By then the remains were unrecognisable and could not be identified. The remains were most likely buried in the Azmak Commonwealth War Grave Commission cemetery in an unmarked grave. This cemetery is in the area were the Suffolks held the front line. Their names are commemorated on the impressive Helles Memorial which stands on the southern tip of the Gallipoli peninsular. 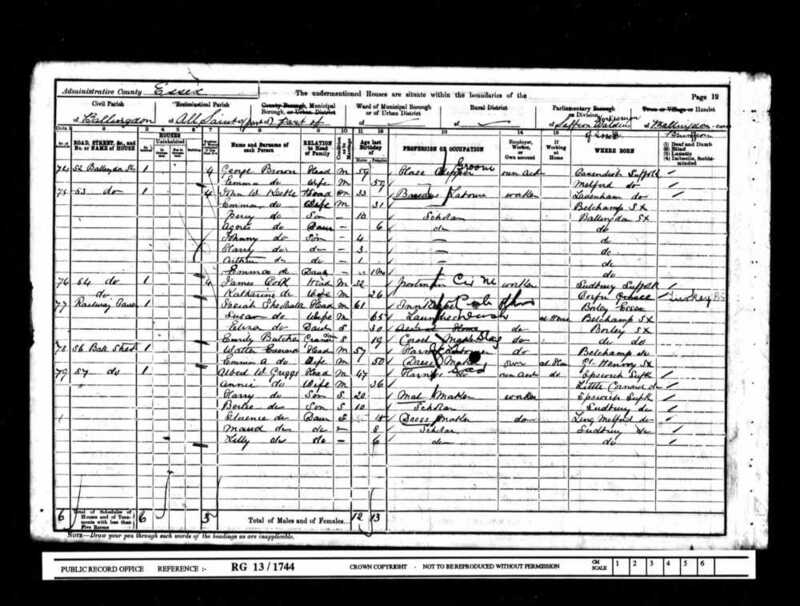 We hope that this page has been able to tell the story of Harry Griggs. If you know of any information which might help to add to the story then please get in touch.